A “Hit & Run” accident occurs when a driver involved in a collision leaves the scene of an accident. Under Illinois law, all involved parties are required to remain at the accident scene and exchange insurance information. If you are involved in a hit and run accident and have sustained an injury or property damage, you still have a legal claim. As experienced Chicago car accident lawyers, we understand that you can pursue an uninsured motorist claim under your own insurance policy. Contacting an experienced hit and run accident lawyer can help you negotiate through the uninsured motorist claim. Handling an uninsured motorist claim can be loaded with minefields, deadlines and requirements. If these requirements are not met, it can result in the claim against your own insurance company for uninsured motorist coverage to be denied. Once you have an uninsured motorist claim, it is your own insurance company that is the opponent. An experienced Chicago injury lawyer can successfully negotiate with you insurance carrier and obtain the maximum compensation available to you. If they are not willing to settle fairly, we can the uninsured motorist case to arbitration. The amount of uninsured motorist coverage that you carry can determine how much your case is worth. We look to many different sources to determine how much coverage you have: the auto insurance policy of the car you are in at the time of the accident, your own auto insurance policy, auto insurance policies of people who live in your home and for excess or umbrella insurance policies that may cover the loss. Finding all of the available insurance for an uninsured motorist case can be complex. An experienced Chicago injury attorney will help you uncover all the available insurance in your case. The very purpose of uninsured motorist coverage is to provide insurance coverage in place of the negligent driver who was uninsured at the time of the crash. Most uninsured motorist claims are handled through an arbitration process rather than filing a lawsuit. The arbitration hearings are typically heard by other lawyers in the community or by a retired judge who serves as arbitration. 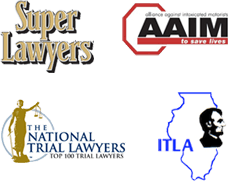 Popular companies in Illinois that operate uninsured motorist arbitrations are the American Arbitration Association, ADR Systems and JAMS. An skilled Chicago personal injury lawyer knows that it is important that you carry adequate underinsured motorist coverage before an accident occurs. You should carry adequate limits on your auto insurance policy and where possible, carry underinsured motorist coverage on your umbrella policy in conjunction with your auto and homeowners insurance policy. The minimum statutory coverage in Illinois of $20,000 per person/$40,000 per occurrence is not adequate insurance coverage if you want to protect yourself or your family. Even $100,000 per person/$300,000 per occurrence is inadequate if you suffer serious injuries and want full compensation. It is very easy to reach $100,000 or more of medical bills if you are seriously injured. You cannot trust that the negligent driver who hits you has insurance or is adequately insured. Only you can protect yourself by carrying appropriate coverage. Statistically, 20% of all drivers in the City of Chicago are driving without insurance. Less than 20% have adequate coverage to cover an accident where serious injuries occur. Make sure that your umbrella policy, which typically carries $1,000,000 or more of coverage, includes uninsured/underinsured motorist coverage.